Are travel rewards cards with an annual fee worth all the fuss? The short answer is … it depends. It depends on the actual card and it depends on your strategy for earning travel rewards. 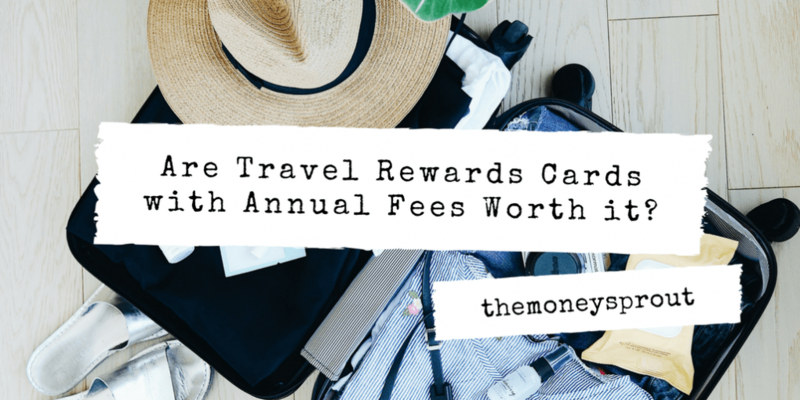 Personally, my wife and I have found that some of the best travel rewards bonuses come from cards that have annual fee’s. So we have decided to include some cards with annual fee’s in our travel rewards strategy. We recently finished up the spending on a card that comes with an annual fee that cannot be waived. Initially I was skeptical of opening any card that comes with this type of fee … but am glad that we did. Just over a month ago, I opened up the Chase Ink Business PreferredSM card in my name … which marks the 3rd card opening in our travel rewards journey. This “business” card requires a minimum spend of $5,000 in the first 3 months of opening … which will earn 80,000 Ultimate Rewards points. That is an awesome bonus compared to other Chase and travel rewards cards. And while hitting the minimum spend of $5,000 is a bit higher than normal (most cards are $4,000) … it wasn’t really an issue for us as we planned it out. We actually planned the opening of the card around paying our homeowner’s insurance that is due at the end of the year. That one time large expense covered almost 80% of the minimum spending requirement for the card! The biggest downside of the card is the $95 annual fee that is not waived in year 1 … unlike other cards. So despite getting 80,000 bonus points, is the $95 annual fee really worth the hassle of opening the card? Personally … I think it was definitely worth it. Let’s take a look at the Chase Ink Business PreferredSM card versus our first card which was the Chase Sapphire Preferred®. Both are great cards to earn awesome rewards … but they each have their own benefits. At a minimum, each Ultimate Rewards point earned from each of these cards is worth $0.01 … if redeemed as cash. So our business card bonus is worth at least $800 in cash. Subtract the $95 annual fee from that, and we are still profiting $705! As far as the Sapphire Preferred, the minimum cash equivalent for those bonus points would be $500. So as you can see, the business card still is a better option … despite the annual fee of $95, provided you can hit the extra $1,000 of spending during the first month. So as I mentioned at the start … the annual fee is worth earning extra bonus points in some cases. It is important to not overlook opening some of these cards … if the math works out … which it did in our case for the Chase Ink Business PreferredSM. The Chase Ultimate Rewards points have not hit our account yet, but will on the next billing cycle. At last check, we are set to earn 85,003 points … of which 80,000 are the bonus points. This is on top of the 1,256 points already sitting in our account. Note – Just like we did with cards #1 & #2, we are planning to open this same business card for my wife next … which will be card #4. We are also hoping to get another 10,000 referral point bonus for me referring my wife. That would be a little more icing on the cake! The points earned from this card, along with the points earned from card #1 will give us just over 150,000 points … which is an awesome start to our journey to travel to Hawaii for FREE! One last item I would like to mention … we also incurred a 2.5% fee by paying our property taxes with a credit card. We specifically planned to meet 80% of our spending on this card by paying for our taxes and were aware of this fee. That fee ended up costing us an extra $101.25, but with the 80,000 bonus points … we were okay with it. More to come on this strategy in a future post … but thought I should mention it here too. Do you open travel rewards cards that have annual fee’s? Have you found instances where the bonus points are just too good to pass up … despite the fee’s?